Members of We Got The Beat's Youth Percussion Band have the opportunity to be up close and personal with many of the world's most influential percussionists. Below are some of the musicians and locales that WGTB members have experienced. Alex Acuña may be one of the most successful Latin drummers to come out of South America. His career has shown people everywhere that Alex Acuña can shine in all types of music styles, including jazz drumming, Latin drumming, rock drumming, blues drumming, and fusion. He was a part of music history on a number of occasions, and has drummed for countless albums and music greats. He can also be heard on many television production projects. With such a variety of skills behind his back, there is no doubt Acuña is one of the top drummers of his style, and of our time. Brad Dutz - Brad started to study music at age seven. After high school, he studied at the University of North Texas and Berklee college of music. In 1982, he moved to Los Angeles and began freelancing untill 1984 when he joined Maynard Ferguson and toured around the country. In addition to his numerous solo CDs (NINE NEDS, KRIN, CAMELS, RAILROADS, GRILL, MAKING ICE, OBLITERATION quartet, MY BONGO, JOHN HOLMES, BRAD DUTZ duos and the first BRAD DUTZ CD), he has co-produced twelve others and played as a sideman for over 250 titles. Hands On'Semble is a contemporary percussion ensemble devoted to the art of hand drumming. Founded in 1997 by renowned percussion vanguard John Bergamo, along with Randy Gloss, Andrew Grueschow, and Austin Wrinkle, the group has developed a repertoire of original compositions blending rhythmic concepts, forms, and techniques from North and South India, the Middle East, West Africa, Indonesia, South America, western chamber music, and jazz. 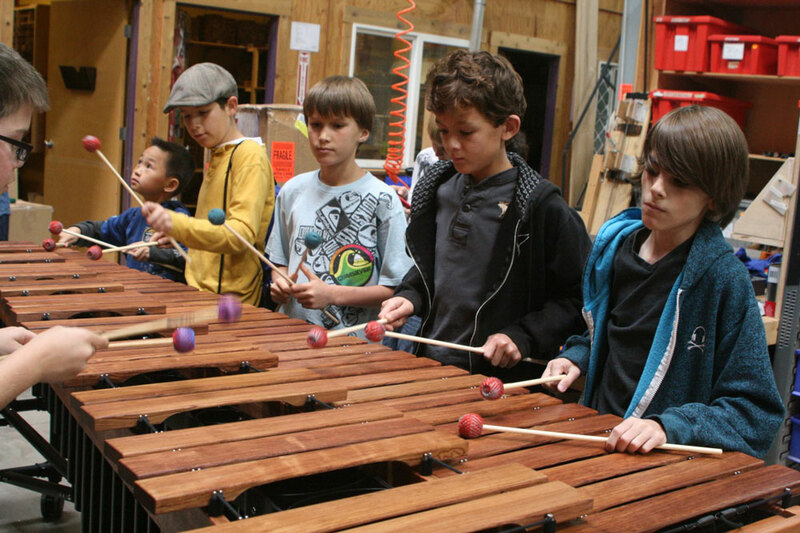 Hands On'Semble has performed and lectured throughout the United States, South America, Europe, and Asia at many of the world's premiere percussion and world music festivals, music schools, and conservatories. Dr. Brian S. Mason is a highly respected innovator of the contemporary marching percussion ensemble. In high demand as a clinician, designer, and adjudicator, he has traveled extensively throughout the United States, Japan, Canada, Korea, and Mexico. His career in the DCI activity has spanned more than two decades, with his most noted work coming via the Cavaliers, Phantom Regiment, and the Santa Clara Vanguard, claiming numerous awards and honors with these organizations during his tenure. Currently, Brian is the Director of Percussion Studies at Morehead State University in Morehead, KY.
Karl Perazzo - Every musician has an idol, a performer or group that embodies what they wish to become. 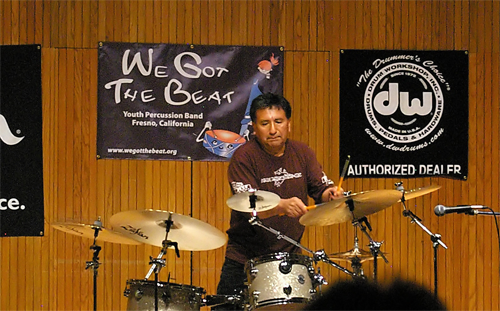 From his childhood in San Francisco, Karl Perazzo wanted to play with Santana. "I used to play with the band when I was younger," he jokes, "but then the needle broke." Raul Rekow - Except for a two-year hiatus at the end of the ‘80s, Raul Rekow has been an integral part of the Santana Band since 1976. Anthony Cirone, retired percussionist with the San Francisco Symphony, former percussion professor at San Jose State, San Francisco State and Stanford. Former Chairman of the music departments at San Jose State and the Jacobs School of Music at Indiana University. He is also a composer of percussion music with over 100 published works. He is a member of the Percussive Arts Society Hall of Fame. Peter Erskine began playing the drums at the age of four and has been at the forefront of world-class jazz ensembles for 40 years. His first major professional work was with the Stan Kenton Orchestra, which he joined in 1972. After a three year stint with Kenton and a two year stay with Maynard Ferguson, Erskine joined Weather Report in 1978. Since then, Mr. Erskine has played with the royalty of jazz musicians. Mr. Erskine has won the Modern Drummer magazine Reader's Poll in the "Jazz Drummer" category 10 times, and was awarded an honorary Doctorate degree from the Berklee College of Music. He currently leads his own jazz trio, living in southern California and touring the world. Members of WGTB visited the Marimba One factory, to see where and how these exceptional pieces of art are created. JR has become the most recorded drummer in history, even surpassing the great Hal Blaine. Some of the hits are, We Are The World, All Night Long, You Are and Say You Say Me by Lionel Richie, I’m So Excited and Slow Hand by the Pointer Sisters, I’m Just A Gigolo and California Girls by David Lee Roth, Higher Love, The Finer Things and Back In The Highlife by Steve Winwood, Express Yourself by Madonna, Off The Wall, Don’t Stop Til You Get Enough, Rock With You, The Way You Make Me Feel, Smooth Criminal, Workin Day and Night and Bad from the late great Michael Jackson, Natalie Cole’s,”Stardust” and Change The World by Eric Clapton, Quincy Jones’ The Dude, Q’s Jook Joint and From Q With Love, Give Me The Night from George Benson just to name a few. Of course in 1983 JR won a Grammy with Rufus and Chaka Khan for “Ain’t Nobody”. Ed Soph is internationally recognized as an author, teacher, and musician. As a performer and recording artist, Ed has played with many big bands, including Stan Kenton & Woody Herman. Small group credits include Joe Henderson & Bobby Shew. Ed is currently recording and touring with trumpeter Marvin Stamm’s Quartet and bassist Eddie Gomez’s trio.He is the author of several videos on drum set playing, including his most recent MUSICAL TIME, published by Carl Fischer. In addition to recording and touring, Ed is a professor in the College of Music of the University of North Texas. He has presented clinics internationally and nationally at major professional conventions of the Percussive Arts Society, the International Association of Jazz Educators, and the Jazz Education Network.